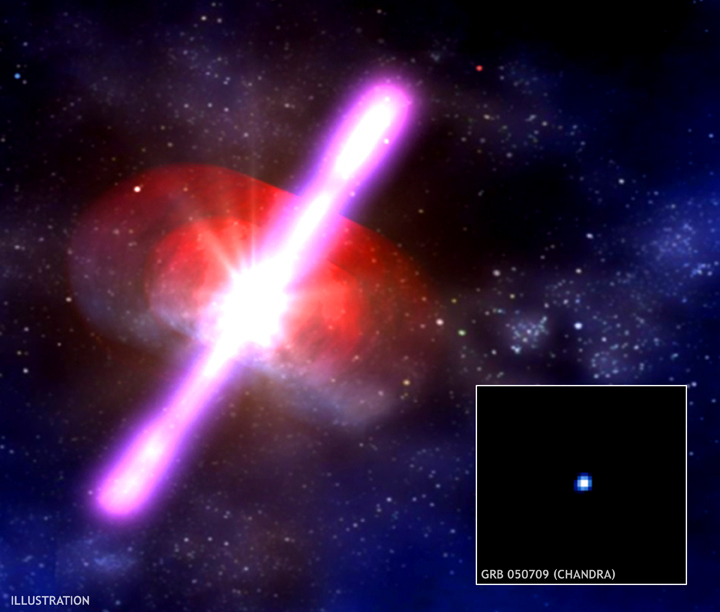 An artist's rendering (left) of GRB 050709 depicts a gamma-ray burst that was discovered on 9 July, 2005 by NASA's High-Energy Transient Explorer. The burst radiated an enormous amount of energy in gamma-rays for half a second, then faded away. Three days later, Chandra's detection of the X-ray afterglow (inset) established its position with high accuracy. A Hubble Space Telescope image showed that the burst occurred in the outskirts of a spiral galaxy about 2 billion light years from Earth. This location is outside the star-forming regions of the galaxy and evidence that the burst was not produced by the explosion of an extremely massive star. 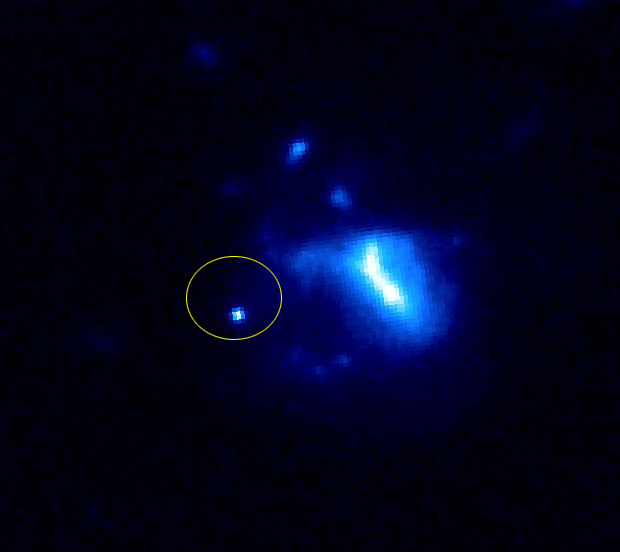 The most likely explanation for GRB 050709 is that it was produced by a collision of two neutron stars, or a neutron star and a black hole. Such a collision would result in the formation of a black hole (or a larger black hole), and could generate a beam of high-energy particles that could account for the powerful gamma-ray pulse as well as observed radio, optical and X-ray afterglows. This gamma-ray burst is one of a class of short-duration bursts that now appear to have a different origin from the more powerful, long-duration gamma-ray bursts that last more than two seconds. Long-duration bursts have been connected to black holes formed in the explosion of extremely massive stars, or hypernovas. Scale Inset X-ray image is 46 arcsecacross. Coordinates (J2000) RA 23h 01m 30.00s | Dec -38º 58' 33.00"